The NSW Esperanto Federation was created in 1966. 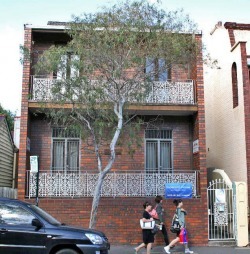 It owns a house called Esperanto domo in Sydney (see picture) conveniently located close to a railway station. That's where we meet usually the first Sunday of each month. The house is used too for board meetings, classes, for the Zamenhof day in December. It houses a library of Esperanto books. The current president of the NSW Esperanto Federation is Jonathan Cooper from Gosford. On Saturday 1st of June 2013 there was a language festival held at Macquarie University in Sydney. At that festival there were presentations about a big variety of languages, including Esperanto. For more details, see http://esperantowebdesign.com/sydneylanguagefestival and look for videos on Youtube. The Australian Esperanto Association organises a summer school nearly each January held in different locations. The summerschool in January 2015 was held in Melbourne from 2nd to 11th January. The first Esperanto congress in Australia was in 1911 in Adelaide, so in 2011 there was a congress in Adelaide to celebrate the 100th anniversary. Special guests from overseas were invited. On this page you'll find a little video with Jomo, a French singer who sang at the congress in Adelaide in Esperanto (July 2011). Aŭstraliaj Esperantistoj is a weekly newsletter with lots of information relating to Esperanto in Australia. It is written entirely in Esperanto. There is no subscription fee but it is available only as a pdf. Please use the contact us form if you would like to receive the newsletter.